A 7500m² rooftop solar electricity system has been installed in South African beach resort,Victoria & Alfred Waterfront. Sustainable Power Solutions with partners Solar World Africa, Schletter South Africa and SMA Solar Technology South Africa partnered to installed the system which was officially switched on yesterday by provincial minister of Economic Opportunities, Alan Winde. The solar system installed in the South African beach resort has an estimated total output of 1,640,000kWh of clean energy per year and is expected to efficiently power several key buildings on the iconic property. 900kW have already been connected to the grid on six roofs. The minister emphasized on the competitive advantages of the project in the Province. He said it would attract more investors and put to light Western Cape’s green economy and renewable energy sector. “Securing reliable, affordable energy is a key focus area for the Western Cape Government. We have set ourselves the target of becoming the greenest region in South Africa. The project is a significant step I the region and is being driven by a special unit. 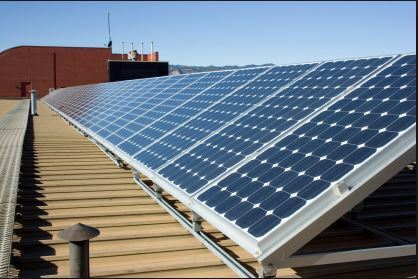 We are looking forward to having solar PV as part of the energy mix at the municipal level,” he said. The standard daily production of V&A Waterfront solar system will be 4495kWh, the energy needed to supply one day’s worth of electricity to 310 average-sized households. With a total output of solar electricity of 1093.8kWp, it will reduce 1610 tons of carbon emissions per year. The installation of the system which took a period of three months was concluded earlier this month by Sustainable Power Solutions and its partners SolarWorld Africa, Schletter South Africa and SMA Solar Technology South Africa. Sustainable power Solutions MD Axel Scholle said the project was completed without any form of delays and within the budget. “Speed was a significant element during the installation process. Despite the challenges linked to the tourist attraction such as the V&A Waterfront, we managed to install 900kW on several roofs within a span of three months,” he said. Winde added that partners in the private sector who committed themselves to work with the Western Cape Government gave him the confidence. He commended Sustainable Power Solutions, SolarWorld Africa and the V&A Waterfront for the initiative, which is one of the largest in the country.